Dimensions 14.5W x 16H in. Manufactured with 100% cotton fiber these custom canvas tote bags feature a natural color, 27” reinforced straps, and large imprint areas that can be personalized with your logo design and brand name in time for trade shows, conventions and giveaways. 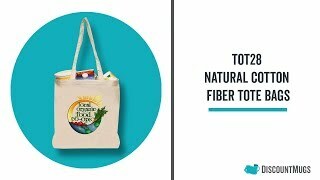 Hand wash only, our unique totes are sure to get the attention of your target audience, and present you with different ideas that will propel your promotional efforts. Popular items that are also easy on the environment, our bags are friendly gifts your clients will love. To get started on your order of wholesale cotton canvas tote bags you only need select your desired amount, printing method, and then follow the simple steps on our design lab to either upload your logo or create artwork of your own. Our free catalog of clipart and fonts are always available to you with your purchase. Feel free to contact our agents at any time during the process should you have questions about the quality of our printed tote bags or customization steps. At DiscountMugs we’re always glad to help. Perfect. Just what we were looking for. Excited to share these reusable totes! These are great inexpensive bags for any event. very pleased with the outcome. good overall value for the price. The bag is a lighter weight cotton than I thought it would be. Overall, I am very pleased.